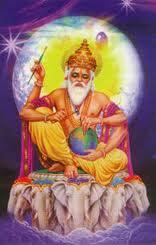 Today 17 Saptember is Celebrate of Architectur Lord Vishwakarma Pooja. 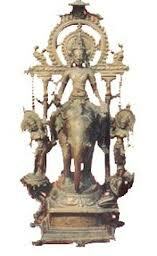 Vishwakarma is the presiding deity of all craftsmen and architects. Son of Brahma, he is the divine draftsman of the whole universe, and the official builder of all the gods' palaces. 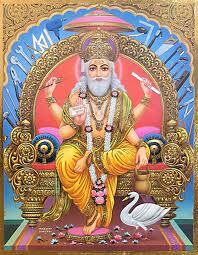 Vishwakarma is also the designer of all the flying chariots of the gods, and all their weapons. Also known as Vishwakarma Day, it is not only celebrated by the engineering and architectural community, but also by other professionals like artisans, craftsmen, weavers, mechanics, smiths, welders, industrial workers and factory workers. It's because according to the religious texts, he is said to be the designer of all flying chariots of Gods and their weapons, tools and their divine attributes. Which is why on this day, idols and images of Lord Vishwakarma and his faithful elephant are established in every workplace and factories which are beautifully decorated with pandals wherein the Puja takes place. Even the family members of the workers and employees come together to be a part of the Puja and the dull premises of the factories and industries come alive with the celebrations. Everybody gathers together under the pandal to perform the Puja and thereafter Prasad (offerings) are distributed among all the people. 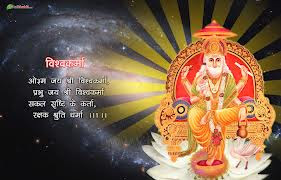 Apart from this, each professional's respective tools are also worshipped in Vishwakarma's name and blessings are sought for a better future, safe working environment, and success in their respective fields. The tools which are worshipped in His name aren't put to work on this day and all work remains closed. There's also a tradition to fly multi-colored kites because of which the sky becomes a war zone and the competitive spirit reaches an all time high as each one tries to cut the other's kite and yell "Ibo Kaata" on top of his voice. Celebrated in all parts of India, Vishwakarma Puja falls on Padyami, the first day of Kartika Masa and is performed on the fourth day of Diwali, i.e. the day after Diwali. 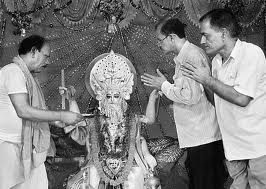 However, in some states like West Bengal, Bihar, Jharkhand, and Orissa, Vishwakarma Puja is also celebrated on the 17th of September every year and doesn't change according to the dates of the lunar calendar. 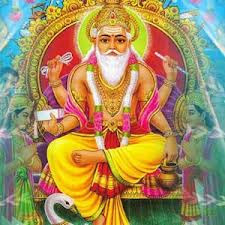 Vishwakarma Puja is an important festival inEastern India and is dedicated to Vishwa Karma, the divine architect of the architect of the universe according to Hindu Scriptures. 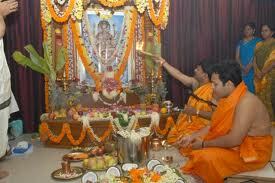 Vishwakarma or Visvakarma Puja is celebrated annually on September 17. 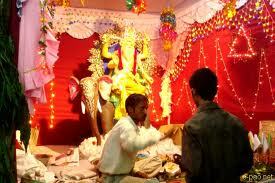 The festival is mainly celebrated in Bengal, Orissa and Tripura. It is a holiday for the industrial belts in this part of India. Kite flying is a major activity on the day. 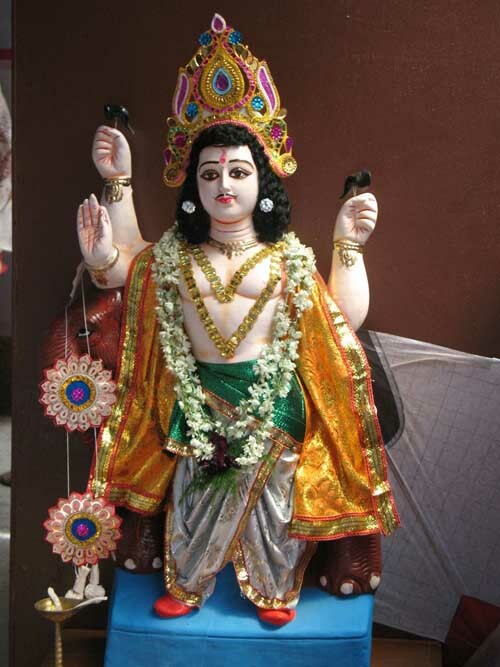 In Hindu Mythology, Vishwakarma is the divine architect of the universe. He is also called the divine carpenter and is mentioned in the Rig Veda and is credited with Sthapatya Veda, the science of mechanics and architecture. Artisans, craftsmen, mechanics, smiths, welders, industrial workers, factory workers and workers of all kind worship Lord Vishwakarma on this day and pray for a better future, safe working conditions and above all success in their respective fields. Workers also pray for the smooth functioning of various machines. 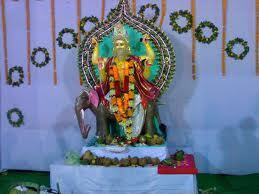 Special statues of Lord Vishwakarma are installed in the workplaces and factories. Nowadays, the statue of Vishwakarma is aptly transformed to match the working place – a factory will depict Vishwakarma like a worker there. Generally, Vishwakarma appears in this mythical image with an elephant, which is his vehicle, and fresh fruits are offered to him. 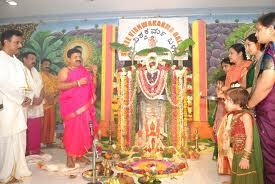 The idol of Vishwakarma at the end of the festival is immersed in water. In homes, women apply vermilion on all the gadgets and pray for the wellbeing of the family. Those own vehicles clean it thoroughly and apply vermilion on it. 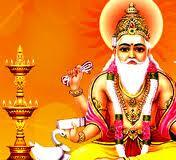 Like in all Hindu festival, there is a special feast on Vishwakarma day. Staff associations arrange cultural programs and all family members participate in the various activities. 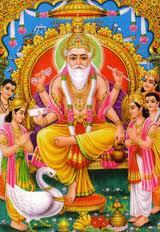 Wishing All of You a Very Happy Vishwakarma Pooja !